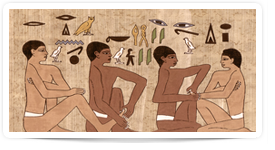 The origins of Reflexology evidently reach back to ancient Egypt as evidenced by inscriptions found in the physician's tomb at Saqqara in Egypt. The translation of the hieroglyphics are as follows: "Don't hurt me." The practitioner's reply: "I shall act so you praise me."